Do you recycle? Here is a project for you! So, do you recycle? For several years now I have been addicted to working with felted wool in my quilting projects. Without a Local Quilt Shop close enough to provide the wool I want and need for my projects I have a considerable stash of recycled wool and the occasional other fabric when it is too awesome to pass up. 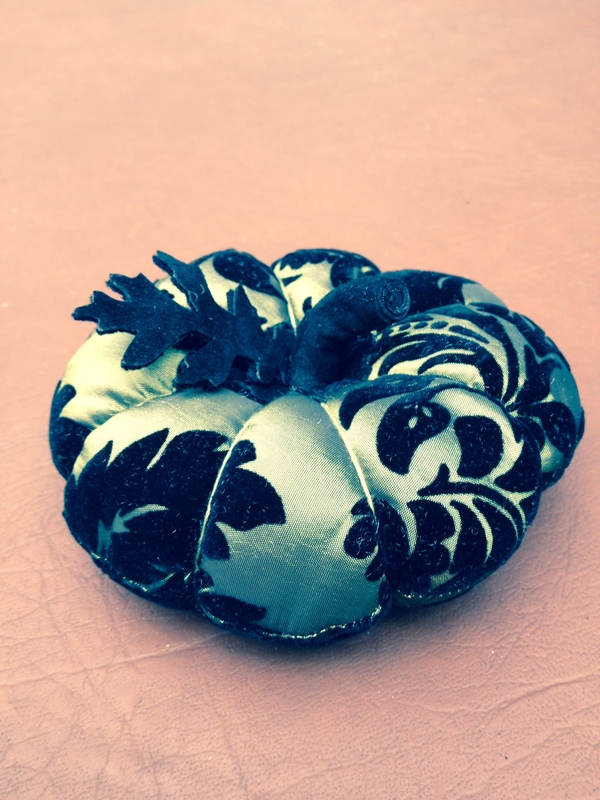 That’s where this Pumpkin Cushion got its start. I couldn’t resist a skirt made of a beautiful irridescent green taffeta with a black velvet jacquard print. Unfortunately the photo doesn’t do this beautiful fabric justice. Die cut with my favorite Sizzix dies. I used the Big Shot Pro Die Cutting Machine, 6″ Circle Die, Tim Holtz Movers and Shapers Die Tattered Leaves, Medium Die Flower Layers w/ Leaf #2 and a 1″ x 3″ rectangle.